Before it was Southsea Village, 81 Palmerston Road used to be Owen’s. I never went in there myself but, from what I heard, it was the kind of place where you would stick to the floor and if there wasn’t a fight then something was seriously wrong. It was rough and ready and always seemed popular with the locals but, as of 2017, it has morphed into a swanky, new pub that serves good food and overpriced pints. Its décor is nice and inside it has a relaxed vibe with large leather sofas, rustic wooden chairs and warm lighting. There are plenty of tables and even a separate room in the back for meetings with a free ping-pong table. As you walk in, the kitchen and bar is on your left and span the entire side, leading to the bathrooms. On the right, you find your seating as well as several TV’s that boast Sky sports. 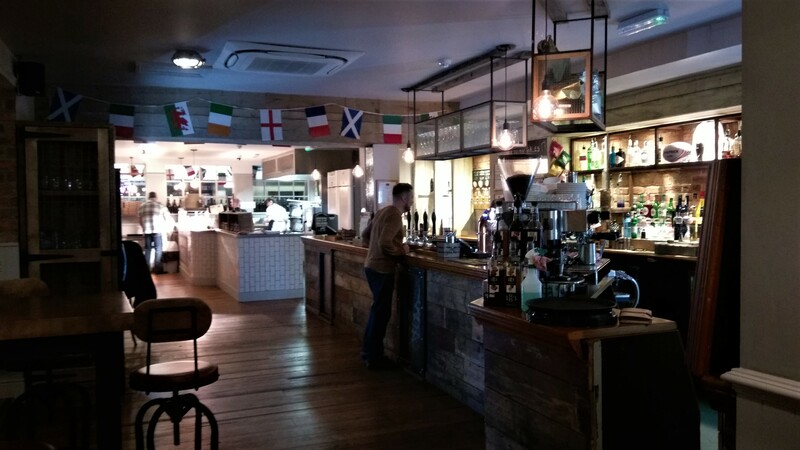 Its huge, light and airy and straight away you know it’s the perfect place to enjoy a chilled night out with a large group of friends. I booked a table online which was quick and easy and, as soon as I arrived, I was sat down promptly by a smiley member of staff. I was given a large menu and told to order at the bar when I was ready. Simple. The menu is what excites me the most about The Southsea Village. Not only do I love the ‘hipster paradise’ vibe but also their extensive range of unique food items. They have the pub classics such as burgers, chips and nachos but they add their signature flair to each one. You can get Asian nachos with prawn crackers, hoisin duck, spring onion and cucumber, Uber chips with pulled pork and BBQ sauce and even a pizza burger with a beef patty, pepperoni, mozzarella and pizza sauce. And that’s only the tip of the tasty iceberg. There are several vegetarian options too which include the veggie ‘Green Machine’ burger with avocado and ‘The Grand Fromage’ pizza with mozzarella, goats cheese, stilton and Monterey Jack. They also give suggestions on the side of the menu such as replacing a burger bun with salad. So, if there isn’t something that takes your fancy, you can always customise your meal to suit yourself. For you vegans out there, you can have your own menu with plenty of pizzas and burgers. Many of the options are the same as the normal menu, such as the Uber chips, but they have meat and dairy substitutes rather than the real thing. But, why would you want to be vegan when you can get four different kinds of cheese on a pizza? Important life choices aside, The Southsea Village have some awesome choices and deals. Monday to Friday you can get a drink and any lunch item for only £5.95, 12pm – 3pm. You can get buy one get one free on pizzas all day on Tuesdays and take away a pizza and whole litre of beer for only £12 every day. That’s cheaper and better than Dominoes. And, what’s even better than that, is that they offer free charging ports and free room hire for meetings and parties alike. So far so good but, like all places, The Southsea Village isn’t perfect. I approached the bar and asked for a pint of coke and was charged £3.30. I know this cost is average for busy Southsea but it’s still too much for some sugar syrup and soda water. I then ordered my food – a ‘Quacking’ burger, a gluten-free ‘Little Italy pizza’ and some ‘Uber chips’. The cost of my food wasn’t so bad with a burger costing just over £11 if you add chips – as sadly it doesn’t come with them. After paying, I sat back down to wait for my food. At this point, I had time to listen to the loud playing music. The tracks varied sporadically from Its Raining Men and Africa to modern day pop songs. As much as I love cheesy music, I found it didn’t fit the mood of the pub and some soft jazz or acoustic sets would have been far more appropriate. Songs like that are best left for Popworld or my shower. Then the food arrived. It came out relatively fast and, in no time at all, the mound of food was placed in front of me. The Uber chips were the first to be attacked. 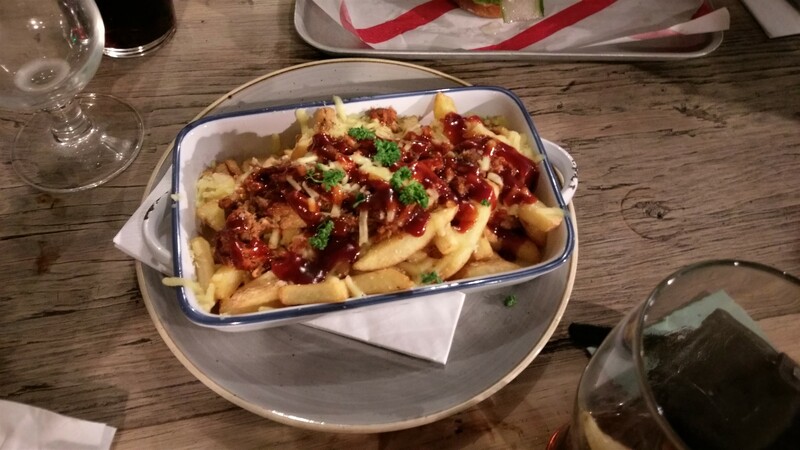 The pile of chips had a generous portion of pulled pork and BBQ sauce on top which was divine. The meat was soft and fell apart in my mouth. It was all so moreish I would have been happy enough stuffing them. 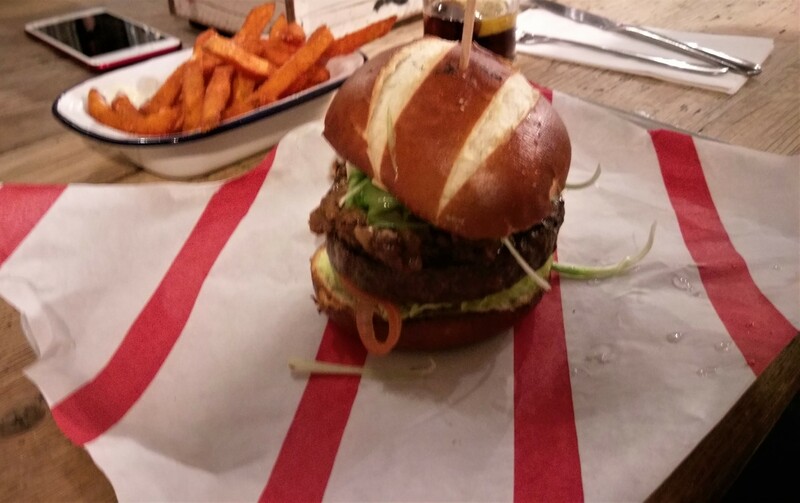 The ‘Quacking’ burger, one of their more unusual choices, was a Chinese style burger with a beef patty, hoisin duck, cucumber and spring onion. It was smaller than I expected but tasted great. It had a good mix of sweetness and tanginess and filled me up more than I thought it would. But, it’s price in relation to size was not so reasonable. Yes, it had some good ingredients but the base cost of £9.95 doesn’t include chips which are an extra £2. £11.95 for a burger and chips is still reasonable but when I say burger I mean a proper sized burger, not a small patty and bun. It was nice, I won’t dispute that, but I am not sure whether the price is fair value for what you get. Finally, was my gluten-free pizza. I noticed that I could add a GF base, free of charge, so I thought I would give it a go as gluten doesn’t agree with me too well. I looked around and saw other people feasting on their pizzas and I stared at them, starry-eyed and salivating. They were huge, thin-crusted beasts that looked gorgeous. You could tell the bases were made in house and everyone who tucked into them made satisfied faces and nods. I was excited about mine but, when it appeared in front of me, I was left a tad disappointed. The gluten-free base was far smaller than the others and didn’t look as rustic. It was a small, thick little thing that I am not too convinced was even hand-made like their other signature bases. It resembled a slightly bigger, glorified Chicago Town microwave pizza. 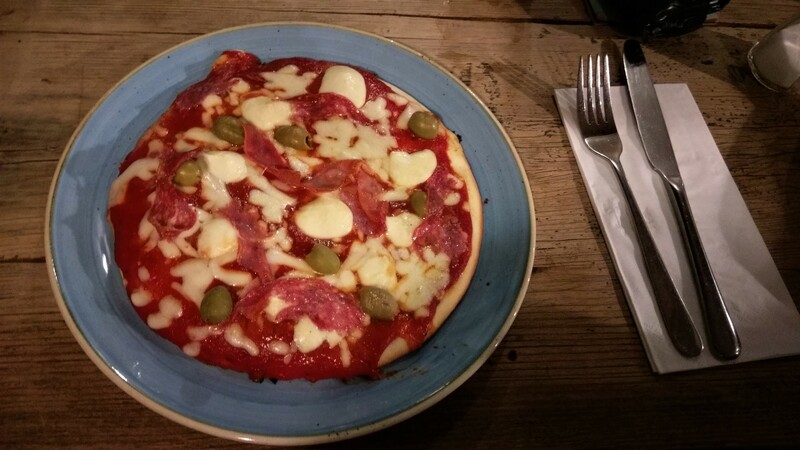 The toppings included mozzarella, olives and deli meats but the presentation was less than appetising. At least there was plenty of meat and cheese. I took a bite. There was far too much sauce and the toppings didn’t stick to the base. As I pulled away, everything came with me and left a bare, tomato smeared base that looked a bit sad more than anything. I left most of it as I wasn’t enjoying my pizza and regretted my dietary choice. The plates were cleared away and I turned to the desserts on the back of the food menu. There were a few choices including ‘Pizza Sweetzer’ which included a banana, toffee sauce and vanilla ice cream. The three sweet choices were less adventurous as their mains but anyway, I ordered an ‘Oozie’ chocolate brownie and a coffee at the bar. 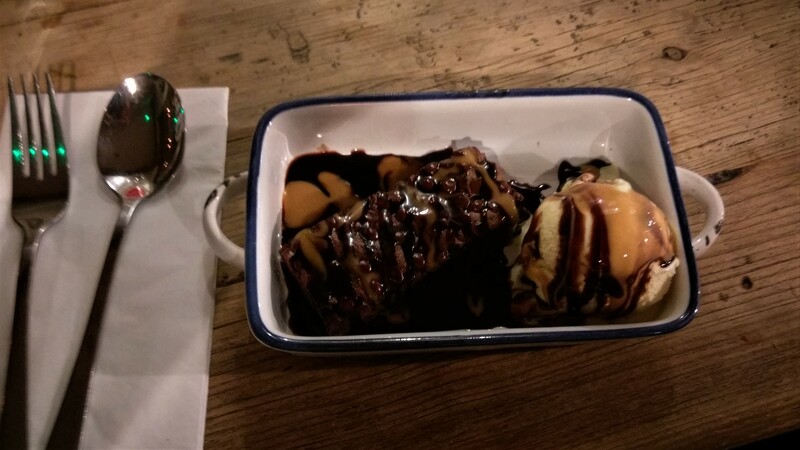 The brownie arrived in a dish with a lump of vanilla ice cream and plenty of chocolate sauce. It was sloppy, gooey and barely saw the light of day. Within seconds, it had joined half of my gluten-free pizza. When I was done, my coffee still hadn’t arrived. So, I licked the spoon and waited. It still didn’t come. So, I licked the bowl and it still didn’t come. At this point, there was nothing left to lick, so I went back to the bar. The waiter gave me a quick look, realised his mistake, briskly apologised and made my coffee straight away. We laughed about it and I thanked him. Not long after, I left and entered the briskly cold-night but I wasn’t satisfied. No, I really wanted one of those pizzas, the ones I saw everyone else eating. So I went back the next lunchtime to get one and make the most of their lunchtime deal. 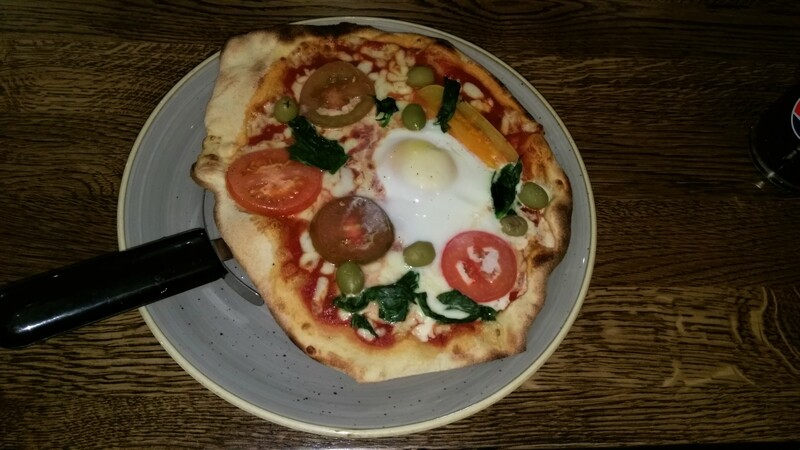 I ordered a ‘Lunch in Florence’ which had olives, spinach, tomato, garlic oil and egg. But, this time, I didn’t ask for gluten-free and what an excellent choice that was. My second pizza arrived on a plate looking far more elegant than my first, with a thin, rustic crust and plenty of toppings. There were generous chunks of tomato and spinach and fried egg in the middle. I was not too convinced about this at first but after tasting the cheesy base with egg yolk I was a changed woman. They say you learn something new every day and I learnt that egg does belong on pizza. The Southsea Village is a lovely place with many pros that do outweigh the few cons. There are great deals, unique flavours, free ping pong and lots of space to relax in. 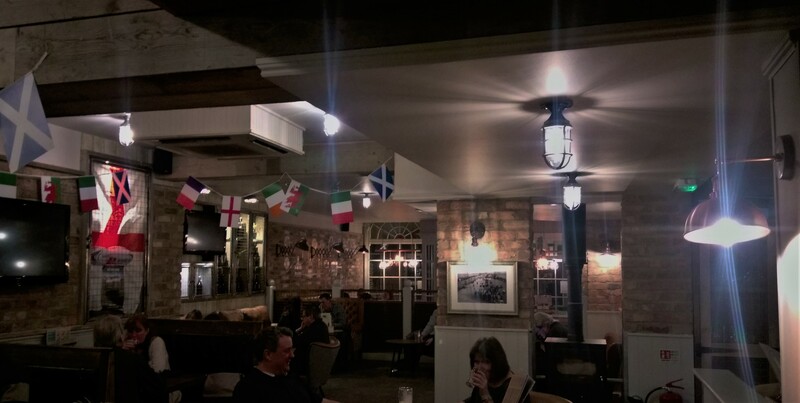 The atmosphere is brilliant, the food is moreish and they accommodate all dietary needs. The only issues are the expensive drinks and, of course, the disappointing, gluten-free pizza base which I hope they improve in the future. I have and will go back. It’s just good luck I’m not celiac…touch wood.